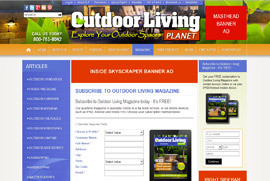 WELCOME TO OUTDOOR LIVING MAGAZINE! 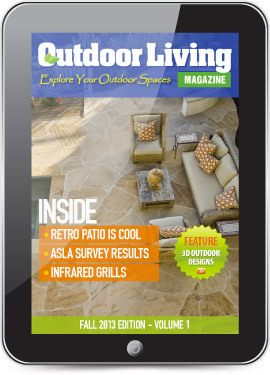 Outdoor Living Magazine (OLM) showcases the latest and most innovative resources for all your outdoor living spaces, bringing together the best quality products and professional services in the industry. Readers who are actively planning or working on their outdoor projects can explore a diverse range of options to gain inspiration. 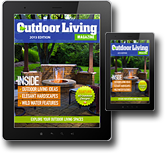 Outdoor Living Magazine covers the latest design trends and product offerings for home owners on any budget. From the latest industry News, Articles, Photos and Videos to finding product manufacturers and local professionals, we provide everything you need to make your outdoor living project a major success! Our quarterly magazine is Free and available Online in a flip-book version, or via mobile devices, such as IPAD, Android and Kindle Fire. 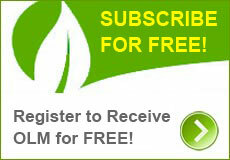 Register for your Free subscription today. Outdoor Living Planet is your premier resource for all your outdoor living needs online. Our web site is jam packed with the latest industry News, Articles, Photos, Videos, with access to product information and industry professionals across the USA. We provide everything you need to make your outdoor living project a major success! Follow OLM on our Social Media platforms to stay abreast of the latest happenings. Get the Latest News and Events from OLM delivered directly to your email inbox via our OLM eNewsletter.